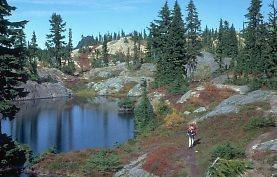 Hiking & Mountain Biking Trails of the BC Kootenays. Trails of British Columbia, Canada. Hiking in this area. The section features a selection of this region's most enjoyable hiking trails. From novice to pro, easy to challenging, there's something for everyone! Catch a glimpse of what to expect. Learn about the area's wildlife and vegetation. Find out about access, campsites and local services. We'll be constantly adding new trails to each region, so check back often.